Innovative mattress retailer GhostBed is joining Wrapify for the technology-based car wrap company’s entry today into the Chicago market. The launch of the Wrapify campaign will debut 50 cars with GhostBed messaging, as well as multiple “Swarms” -- when a large number of wrapped vehicles all converge in one area, to dominate the visual landscape -- throughout Chicago. Innovative mattress retailer GhostBed is joining Wrapify for the technology-based car wrap company’s entry today into the Chicago market. The launch of the Wrapify campaign will debut 50 cars with GhostBed messaging, as well as multiple “Swarms” -- when a large number of wrapped vehicles all converge in one area, to dominate the visual landscape -- throughout Chicago. GhostBed is revolutionizing the mattress shopping experience, from nightmare to dream. It puts the in-store showroom stress to bed, and replaces it with a 101-night in-home sleep trial of the company’s American-made quality latex and gel memory foam mattress in a box, with free shipping. Wrapify likewise revolutionizes car wrap advertising by incorporating the sharing economy, real-time data and analytics, and American drivers — who get yet another opportunity to monetize their time on the road. GhostBed, a proud partner of the Cubs CBS Radio Network and WGN BlackHawks, is making a significant splash in Chicago along with the San Francisco market, and sees Wrapify as a key strategic marketing partner. Chicago is the latest top-tier media market to be added by the adtech/outdoor advertising company, following its March debut in New York City. The company had a breakout 2015 after first hitting the road in a pair of California markets last July. Wrapify has now broadened its presence to six states and 18 markets. The GhostBed is made in America by Nature’s Sleep, a mattress industry leader for over fifteen years, focusing on high-quality, low-cost sleep products. With expert craftsmanship and superior materials designed for comfort and durability, the GhostBed offers an affordable alternative in the online mattress marketplace. The only mattress of its kind that comes with an optional matching foundation, the GhostBed ships in 24 hours, delivered to your front door with free shipping, and includes an industry-leading 20 year Warranty and 101-Night free trial period. 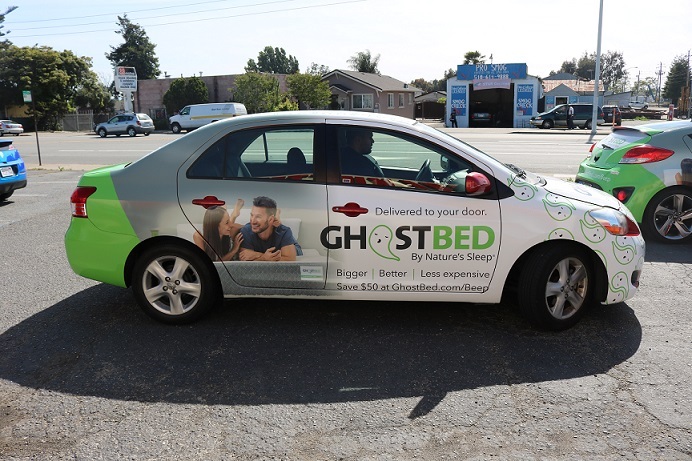 Innovative mattress retailer GhostBed joins Wrapify, a technology-based car wrap company, with 50 cars in GhostBed messaging in the Chicago market.